Gerard Way and Gabriel Bá’s Eisner-winning comic The Umbrella Academy is headed to Netflix as a TV series in February, and this weekend brings us our first look at the hourlong, live-action adaptation. The series’ story begins in 1989, when 43 babies are born to random women who, until the day they gave birth, had showed no signs of being pregnant. 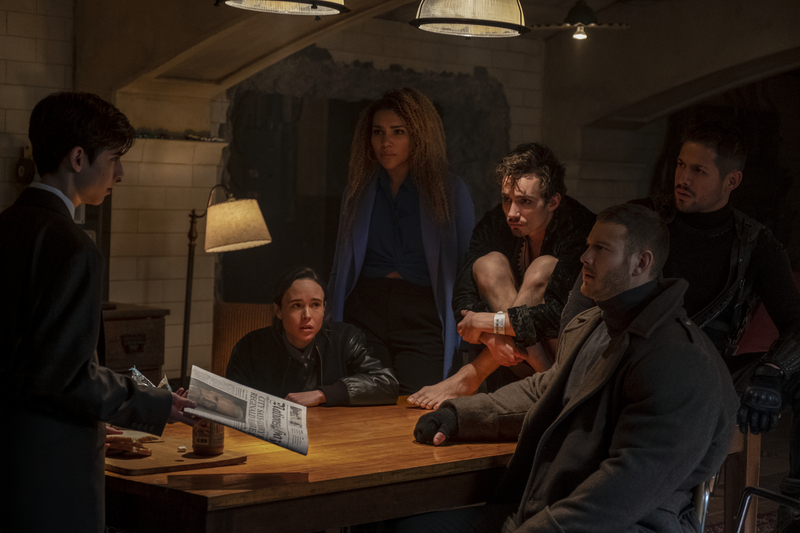 Billionaire industrialist Sir Reginald Hargreeves (Colm Feore, House of Cards), aka The Monocle, adopts seven such infants, creating The Umbrella Academy and training his “children” to save the world. However, things go awry during the children’s teenage years, fracturing the family and scattering the team. Fast-forward to the present day, when, upon the news of Sir Hargreeves’ death, the team’s six surviving members—Luther (Tom Hopper, Game of Thrones), Diego (David Castañeda, Sicario: Day of the Soldado), Allison (Emmy Raver-Lampman, A Million Little Things), Klaus (Robert Sheehan, Mortal Engines), Vanya (Ellen Page, Inception) and Number Five (Aidan Gallagher, Nicky, Ricky, Dicky & Dawn)—reunite to solve the mystery of their father’s death, all while grappling with the dysfunction stemming from their divergent personalities and abilities … not to mention the imminent threat of a global apocalypse. In addition to the series’ core six, Nicky, Ricky, Dicky & Dawn stars Mindhunter breakout Cameron Britton, who has been everywhere since his chilling turn as serial killer Ed Kemper in the Netflix series, and Mary J. Blige, Oscar-nominated for her performance in Dee Rees’ Mudbound (yet another Netflix production), in her biggest TV role to date. Britton and Blige play Hazel and Cha-Cha, respectively, a pair of time-traveling assassins for hire. Additional cast members include Adam Godley (Breaking Bad), John Magaro (Tom Clancy’s Jack Ryan), Ashley Madekwe (Salem) and Kate Walsh (13 Reasons Why). As for the teaser trailer itself, initial reactions online have been positive, and it’s easy to see why: The stylish, quick-hitting clip shows off The Umbrella Academy’s impressive cast and high-concept premise with panache, suggesting an adaptation that measures up to its acclaimed source material, which was created and written by Way, illustrated by Bá and published by Dark Horse Comics. Come February, we’ll see if the Netflix iteration can fulfill its apparent promise. 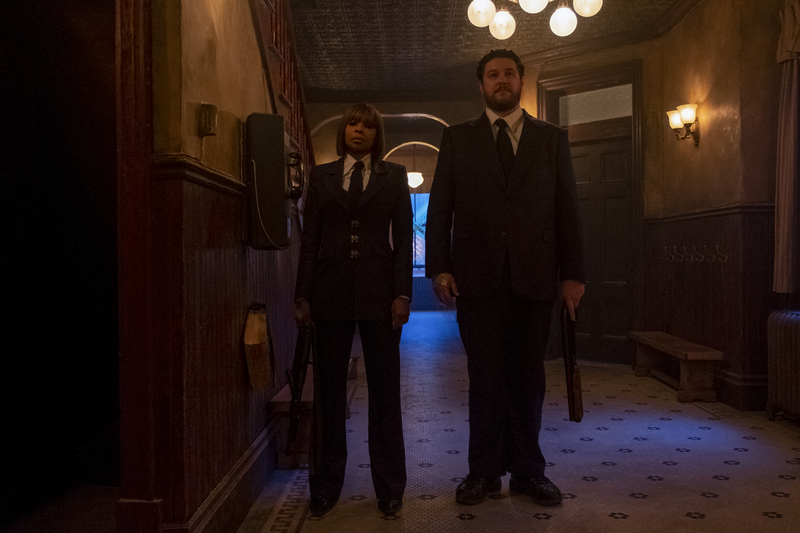 Universal Cable Productions produces The Umbrella Academy for Netflix, with Steve Blackman (Fargo, Altered Carbon) serving as showrunner and executive producer. Additional executive producers include Jeff F. King (Hand of God), Bluegrass Television, and Mike Richardson and Keith Goldberg of Dark Horse Entertainment. Way and Bá serve as co-executive producers. All 10 episodes of The Umbrella Academy hit Netflix on Feb. 15, 2019. See the show’s first teaser below, along with a few first-look photos.